All diet attempts had failed and she was due for bariatric surgery. ​... But it took him 3 years to find out just why so much of today's traditional advice on slimming and chronic illness is wrong. ​Now, he tells his journey of discovery and explains how this approach can help you. “I really enjoyed the read. It took me on a journey rather than just throwing loads of facts and instructions at me. “I found this book very interesting and thought provoking, as it is based on a great deal of research. For those who want to delve deeper into the science and comparative research, Pepys provides plenty of that. But there is also a very good summary section. He also has some interesting ideas on the food allergies, intolerances and digestive illnesses which affect an increasing proportion of the population. ​Summary: "Eating fat does not make you fat, it helps make you healthier"
... and also selected by www.lovereading.co.uk experts. "Back in 2012, Sammy Pepys just wanted to help his overweight sister-in-law, Katy, avoid a tummy tuck (bariatric surgery), knowing that all previous attempts at dieting had failed. So he developed a plan showing how best to go about things, which she then put into practice. It worked. It was the first successful diet Katy had ever completed, achieving a 20 kilo weight loss and much-improved blood sugar levels along the way." 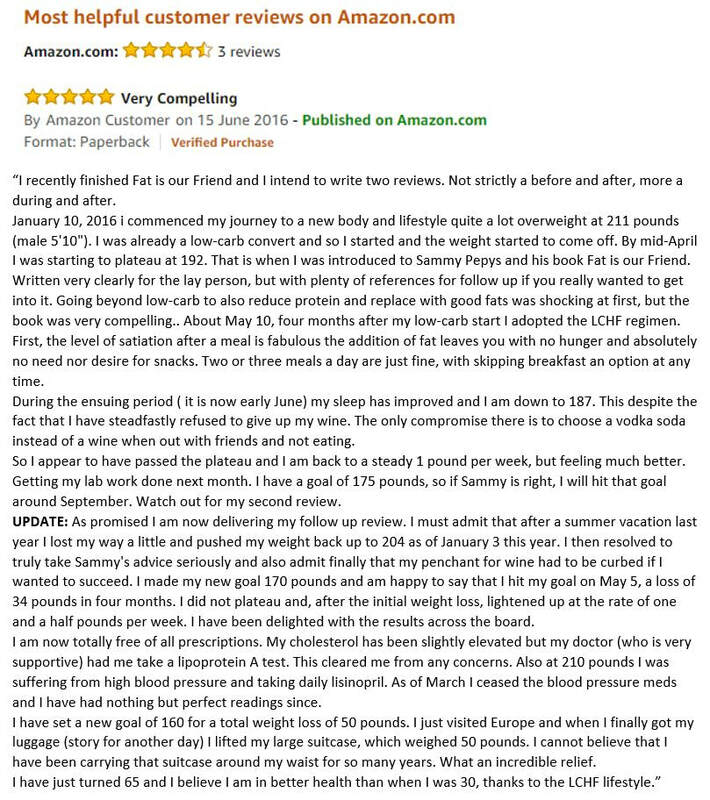 This American reader of Fat is our Friend lost over 15 kilos in weight but more importantly... he's off his medication. He reports following the low-carb, high-fat guidelines from the book and also that his doctor was very supportive! A real help.